Does your engine back fire and you are wondering why? We are a group of ASE certified mechanics that have created this guide to help you save money by fixing your car yourself or to see what you are paying for when taking it in for repairs. When your engine back-fires it can do so in one of two ways. First and the most common way is when the engine is running a small explosion of un-burnt fuel is ignited inside of the intake manifold creating a loud bang which is the backfire sound you hear. This explosion can bend the throttle actuator plate, push intake gaskets outward creating a vacuum leak and even blown apart a plastic intake manifold. When intake manifolds were made of aluminum they could better withstand this kind of problem. This occurrence can happen once or a few times when the engine is under load. Or it can happen continuously signaling a mechanical failure which we will go over in the following repair. The second kind of problem will occur from the rear of the vehicles tail pipe which is a rich fuel mixture problem that can happen when fuel delivery parts fail such as an injector, fuel pressure regulator or intermittent ignition system failures. A backfire condition can also occur in race cars using a turbo charger which is normal because they push the fuel through the engine which is then ignited in the exhaust system. We will cover the primary occurrence of the engine under load first. This problem must be corrected and can not be neglected because serious engine damage can occur. On the small side of things a simple vacuum hose might get pushed off which is an easy fix. 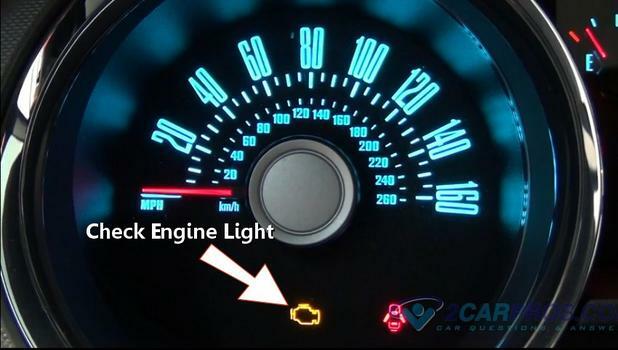 Anytime you have an engine that is backfiring the first thing to look for is a check engine light. If no warning lights are on continue down this guide. 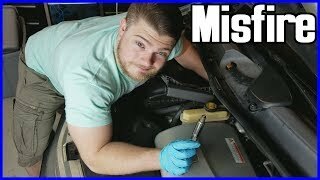 If the check engine or service engine soon light in on scan the computer for trouble codes. This will help locate the system that is having a problem and needs repair. An intake back-fire explosion can be caused by the fuel air mixture being to lean when the engine is demanding power. Every internal combustion engine runs on a mixture of 14 to 1 which is fourteen parts air to one part fuel. Proper fuel pressure is needed to atomize the fuel correctly when it leaves the fuel injector to complete the burn process. The most common cause for this problem is a weak fuel pump which cannot supply the volume of fuel needed for the injectors to produce a proper spray pattern or deliver the amount of fuel needed for engine acceleration. 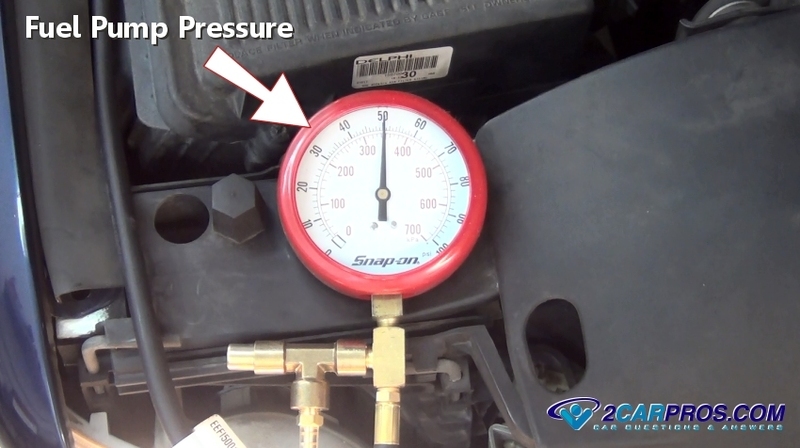 The fuel system pressure must be tested to see if the fuel delivery system is the problem. Some cars have a fuel filter which can also cause a fuel pressure and volume restriction. When they plug due to particles in the gasoline they can case a lean condition. If you have not changed the fuel filter lately locate and replace it. Your vehicle's computer system monitors the air that enters the engine via the mass air flow sensor. 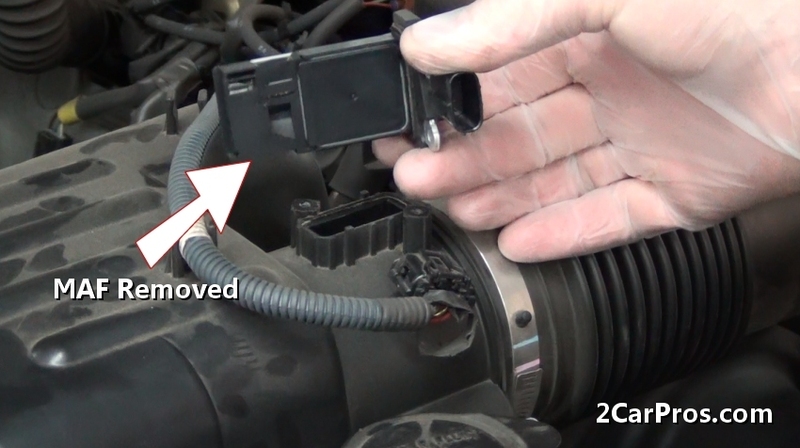 When this sensor malfunctions due to a condition called coking the hot wire inside the sensor becomes contaminated and will alter the reading to the computer which will create a lean mixture condition that may or may not trigger a check engine light. The lean condition is because the computer thinks there is less air entering the engine than there actually is, less air means less fuel. The first step is to remove the MAF sensor and clean it using carburetor cleaner. We have had better luck by replacing the sensor because once this condition happens the hot wire can become unresponsive in which case the sensor needs to be replaced. 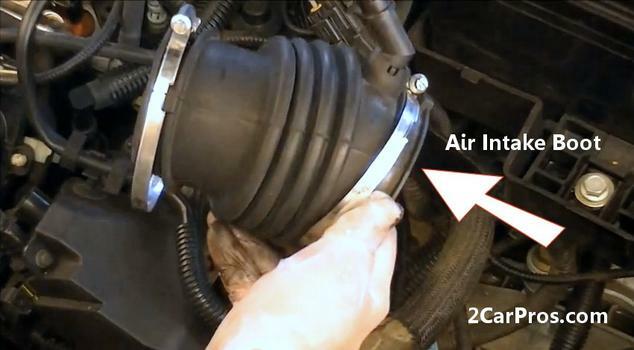 The air intake boot or tube transfers air from the mass air flow sensor into the throttle actuator and then into the engine. If there is a problem with these parts such as a tear or rip it will allow un-metered air into the engine which the computer will see via the oxygen sensor which in turn will deliver less fuel creating a lean condition. Check this part for damage by removing it for inspection and replace it if needed. The engine's intake system depends on being completely sealed and free from leaks. 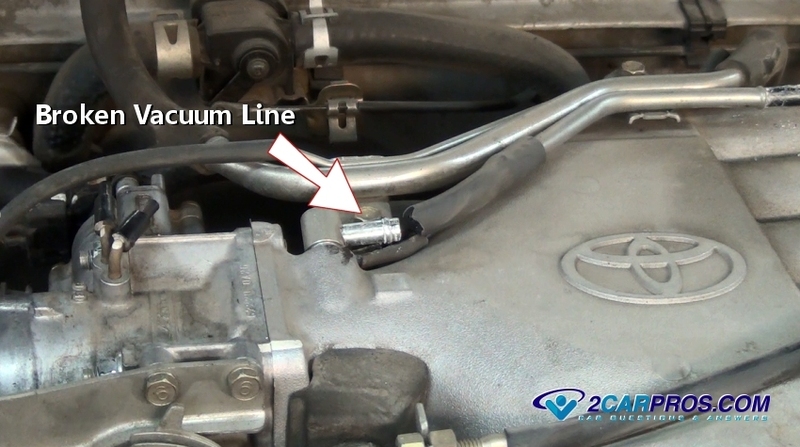 If a main vacuum hose such as the power brake booster feed line has broken or failing off it will cause a lean backfire due to the additional air allowed into the engine intake manifold. This problem will be accompanied by high or low engine idle and a harder to push brake pedal than normal. Using a smoke machine or carburetor cleaner you can check for a vacuum leak and repair it to fix the problem. A repetitive backfires are generated when the engine is simply running at idle or at cruising speed and can be inline with the engine RPM. A rhythmic popping sound which is not as prominent as lean under power backfires. The problem list below will give you an idea of what causes could be generating this condition. The engine's ignition system is triggered by an electronic driver which signals the ignition coil when to fire. By design the resistance it takes to fire the coil via the spark plug is figured into the system. 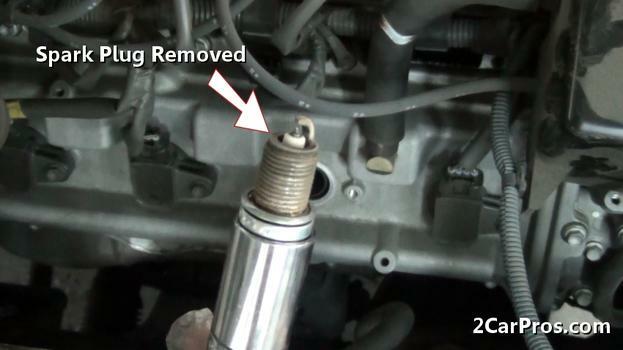 When this resistance becomes excessive due to severely worn spark plugs or a bad ignition coil it can cause these drivers to malfunction at which point they can crossfire into an opposing cylinder either under power or at idle. This condition may or may not be detected by the computer so the check engine warning light may not come on. Spark plugs should be changed at regular intervals, platinum plugs at about 60,000 miles which will correct this problem. A camshaft is used to open the intake and exhaust valves of the combustion chamber to allow intake air in and the spent exhaust gases out. If the exhaust valve lobe becomes worn and loses its lift the fire from the exhaust gases are still left in the cylinder which is then released into the intake manifold once the intake valve opens. 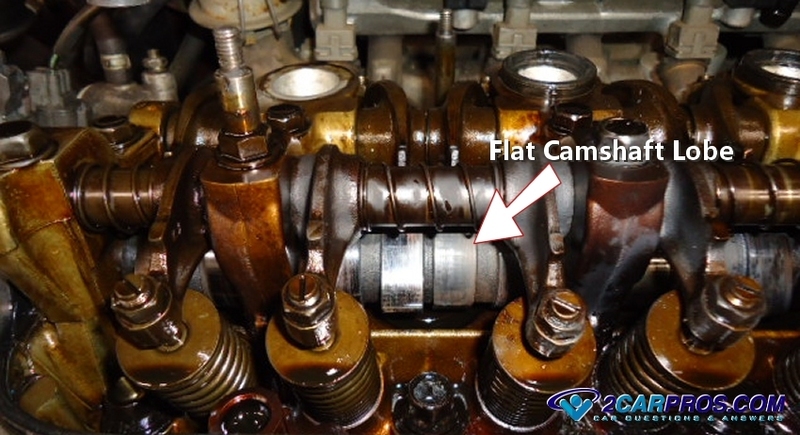 To check for this condition you must first remove the valve cover(s). After the valve covers have been removed and with the ignition disabled (coils off) crank the engine over and observe the intake and exhaust valve operation, opening and closing. Also, if the intake or exhaust valves are not closing completely due to a broken valve spring it will allow the combustion gases to enter the intake manifold much like a flat camshaft lobe. 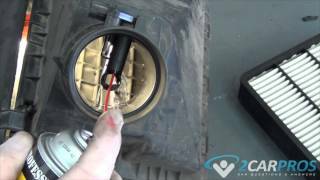 Use a flashlight in carefully check the valve spring windings. These springs can break either at the top middle or bottom of the spring which can be sometimes be difficult to see. A bent push rod can also cause the valve not to work properly by restricting the movement of the valve. While the valve cover is still removed look at each of the pushrods to see if there is an obvious bend to them. This also can be done by detecting poor rocker arm movement while the engine is being cranked over. An exhaust tail pipe backfire is caused by an excessive amount of un-burnt fuel remaining in the exhaust system or fresh air being allowed to enter the system which ignites a small amount of un-burnt fuel. If fresh air is allowed to leak into the exhaust system it will ignite the un-burnt fuel inside the system creating a popping noise. It is difficult to think of because most people think of a exhaust system to be under constant pressure but this is not true. The system is fed with a series of pressure and vacuum pulses which are created by the exhaust valve opening while the combustion charge being expelled into the system, and then the valve closing. This is where the vacuum event is created by the pulse velocity and the fresh air let into the system. 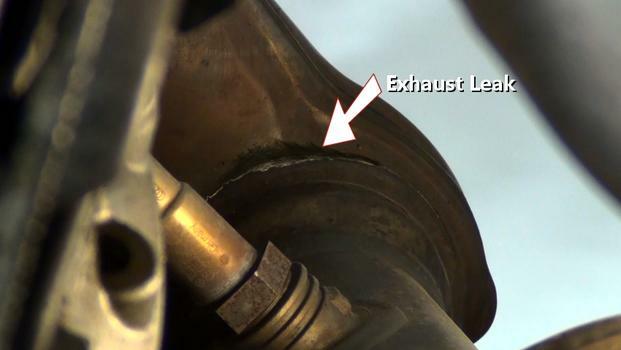 This is why you can get a lean mixture trouble code when there is an exhaust system leak. Inspect the system and repair any exhaust leaks present. This detection is done by looking for a flat back shoot which is evidence of a leak. On engines made from about 2001 and older are equipped with a air injection system that is fed into the exhaust system when the engine is under load. This is to burn unspent fuel which helps the emission system work better. This systems is fitted with an air gulp valve that acts like a one way check valve to allow air into the system when the engine is under load. This gulp valve is fitted to the exhaust manifold via a large pipe or an individual port tubing configuration with a rubber tube that connects to an air pump. When the valve goes bad air is released into the system at all times even during de-acceleration which then created a backfire kind of popping due to the fresh air igniting the unspent fuel. Most engines have one or two of these valves one for each exhaust manifold. To check these valves you must remove them and then try to blow through them each way. Only one direction is all that should be allowed. If air is allowed in both directions the valve is bad and should be replaced. Check out the video on how to fix and engine backfire. When high performance turbo engines are under load they use an excessive amount of fuel which then is transferred into the exhaust system once the throttle is let up on and the engine is de-accelerating. This is a normal event and there is no problem with this condition. On older engine's ignition timing is set at a specific degree in relationship to the crankshaft. If this timing is mis-adjusted it can cause low power, poor gas mileage, engine detonation (pinging) and backfiring through the intake or exhaust system. If you need more information on engine backfiring please visit our forum which features hundreds of previously answered questions answered by our team of ASE certified mechanics or if you want to ask us a question please do so, we are here to help.